The acai berry grows on a palm tree (Euterpe oleracea) that is native to Central and South America, as far south as the Amazon region of Brazil. Indigenous people have eaten this fruit for centuries in the belief that it helps to keep them healthy and that it will help to heal diseases. This berry has become popular among health enthusiasts in the United States and other countries in recent years for its antioxidant properties. If you live in USDA Plant Hardiness Zone 10 or higher, you can grow an acai palm in a swampy, shady area among other trees. Soak dried acai berries in warm water for up to two days. Then fill 1-gallon nursery pots with drainage holes with standard potting soil and make two to three holes ½-inch deep in each pot. Drop one acai berry into each hole and cover with potting soil. Water well, until water comes out the drainage holes and keep your newly planted seeds moist and in a warm, partly sunny spot. 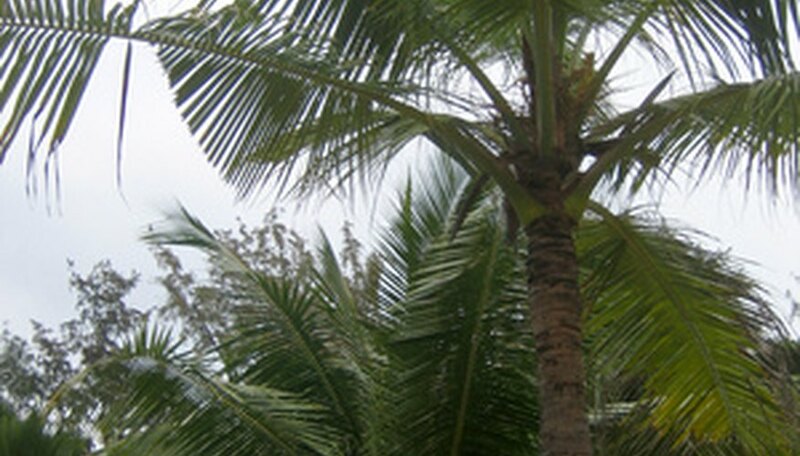 Prepare a planting area for your acai palm when it is 6 to 12 inches tall, which can take up to one year. Choose an area under other trees where the soil is almost always moist and full sun almost never occurs. Dig a hole at least twice the size of your acai palm’s root system and then mix in 1 part compost to every 4 parts of soil. Set your young acai palm tree into its planting hole and fill with additional soil/compost mixture. Firm the soil with your foot and then water well by running a hose at a slow drip for about one hour at the plant’s root zone. Fertilize your acai palm with cow manure dissolved in water. Fill a 1-gallon bucket with purchased cow manure and mix it with 5 gallons of water. Water your acai palm with this mixture four times each year at evenly spaced intervals. Use all of the 5 gallons of manure tea when you fertilize your palm. Harvest acai berries three or four years after you plant your palm tree. You can eat them fresh, as fruit, or make juice from them. Harvest acai berries when they turn dark purple. The acai palm tree also produces heart of palm, which you can harvest by cutting one of this palm's stems. Hawaiian Ecosystems at Risk reports that the acai palm is being studied to determine its invasiveness potential in Hawaii. As of 2010, it has not been classified an invasive species. Acai palm trees can tolerate temperatures only as low as 50 degrees F. It is possible to grow them in greenhouses in climate zones outside of the tropics, but conditions must be right.